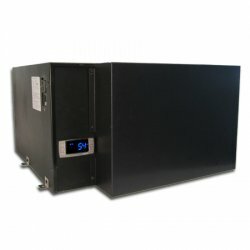 When used with Cellar Pro's 1800 Series cooling units, the Front Intake Hood allows for the cooling unit to be installed above the wine cellar instead of inside the cellar. If the space above the cellar isn't large enough enough for the hot air produced by the cooling unit to dissipate, Cellar Pro's rear duct kit can also be used to duct hot air intake/exhaust up to 50 equivalent feet. In the ceiling of the wine cellar, there must be two openings. One in order to allow for return air (using the hood), and the other for supply air (below the exhaust fan). NOTE: THIS UNIT SHOULD NOT BE DUCTED.